Our team at Duvall was lucky enough to cultivate a partnership with Charleston culinary legends, Matt and Ted Lee back in May of 2013. The Lee Brothers’ craveable Southern cooking, tried and true recipes and spirited personalities have graced a handful of incredible events since the partnership. Duvall’s relationship with The Lee Brothers actually first dates back to the late 1970s. Our founders, Peter “Stephen” Milewicz and Dan “Duvall” Stephens were close friends with Matt and Ted’s parents. The Lees would enlist the help of the Duvall founders whenever they hosted a party, they even shared holiday dinners together. Matt and Ted grew close to Stephen and Dan over those years and they credit the duo for helping them establish a true passion for entertaining. Everything Matt and Ted do stays true to tradition and honors the South’s culinary heritage. 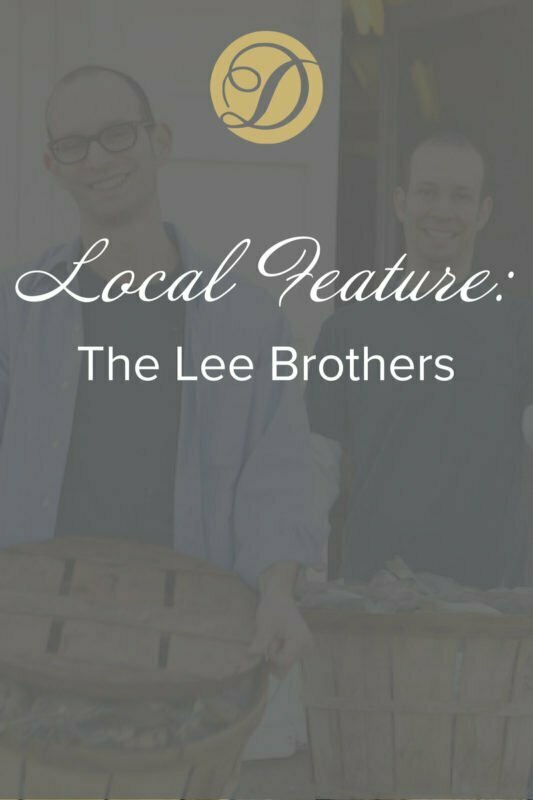 They have handpicked local ingredients to fulfill many of the recipes from their newest cookbook, The Lee Bros. Charleston Kitchen. In their most personal cookbook yet, they state that,” With these stories and recipes, we show you what it was like to grow up here and how the food life of Charleston helped make us the cookbook authors we are today”. Another book penned by the brothers, The Lee Bros. Southern Cookbook won James Beard Cookbook of the Year. Their love for local and Southern flavors don’t stop there. Matt and Ted even host culinary foraging tours where they take a walking tour around Charleston to find some of their favorite ingredients, including loquats. Our 10,000 square-foot facility on Azalea Drive gives the team access to back-of-house amenities as well as a state-of-the-art demonstration kitchen that can accommodate up to 60 guests. The Lee Brothers are available to create specially designed menus for events ranging from intimate luncheons to full-scale weddings. Lowcountry delicacies are available for breakfast, lunch, and dinner in any setting. Planners even have the opportunity to schedule the iconic duo to appear at their event. Menus can include wine pairings and are created with fresh ingredients for chef-selected recipes. Matt and Ted’s deep understanding of Charleston’s rich history, culture, and traditions imbues their food with genuine Southern charm. Next March, the team at Duvall is excited to celebrate our 40th anniversary! We cannot wait to look back on 40 wonderful years of planning exceptional events with “Duvall Through the Decades”. In preparing for the exciting things to come next March, The Lee Brothers sat down with us to discuss what the Charleston catering industry really looked like in the 1970s, 80s, and 90s. Having seen their parents’ catered parties and growing up around Charleston’s entertaining society, they were able to provide a glimpse into how the industry has evolved. Having truly experienced “Duvall Through the Decades”, we can’t think of better representatives to detail our company’s history in Charleston. We look forward to sharing a behind-the-scenes look into the past, present, and future of catering services in the Lowcountry. © Copyright 2019 Duvall Catering & Events. Designed and Maintained by The Modern Connection.